A walking tour of the Bloor and Bathurst area as a Fringe show? I had absolutely no idea what to expect. A small group of us assembled at the entrance to the Fringe Tent this afternoon at 5.30 and were led down the alley to meet Evelyn Reese. And so began Evelyn Reese’s Walking Tour. I didn’t count, I think there were about 15 of us – maybe 20. Brave souls, being a moveable audience. We walked from Honest Ed’s to Future Bakery, crossed Bloor and walked back to Honest Ed’s. Evelyn stopped frequently to tell us tidbits about herself and her life in a really loud voice. People stared. And did double-takes. Some laughed, some looked bemused. We went into Honest Ed’s, My sister’s Closet, Second Cup, A futon store, a Hungarian restaurant (Biggest schnitzel I’ve ever seen!) Evelyn greeted people everywhere and told us little stories about each place – little stories about Evelyn and the place we were in. It was fun. The way an hour with your Aunt Bertha (“She’s such a character”) is fun. You know she’s going to say inappropriate things at the top of her voice and embarrass the heck out of you but she’s funny and kind of endearing – and she makes people laugh. I’ll carry a mental picture of Evelyn’s windmilling arms directing us across the street for a long time. Take the tour. You’ll be glad you did. 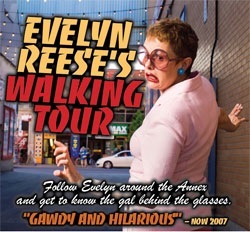 – Evelyn Reese’s Walking Tour starts from the Fringe Tent, behind Honest Ed’s and lasts for about 45 minutes.